I made some pumpkins like this last year for the kids teachers. I put a little bit more embellishments on theirs though. This is supper easy, even if you aren't much of a sewer. 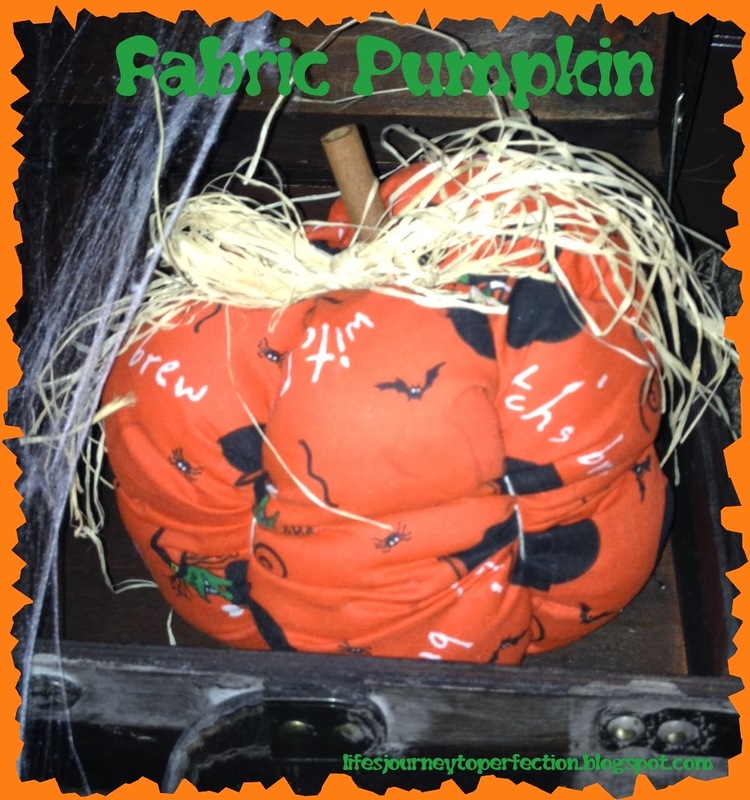 Fabric- the size of the fabric will determine the size of the pumpkin. Examples 20x20 inches would be a more round pumpkin, where 20x34 inches would be a tall pumpkin. This would be a good size. You could definitely go smaller. The one above is smaller. Fold fabric in half right sides together and sew along the raw edge. Turn fabric out, so right side is on the outside. Take a needle with some thick thread or embroidery floss and do a gather stitch along the bottom, closing it, knot it so it will not come undone. Start stuffing the pumpkin with the batting. Stuff until full and then do a gather stitch at the top, closing it up again. Take two long pieces of string or thick embroidery floss. Lay on floor, place pumpkin on top in the middle. Bring string up and tie in knot. This should be done tightly so some fabric puckers out, as above. Do the same thing the opposite way so it crosses like an x at the top and bottom. Hot glue the stick into the top. Tie the raffia in a bow around it. You may add some more embellishments such as: scrap fabric, silk flowers a little sign saying "Pumpkin Patch", a spider, etc.